9 awakens. The world he enters is much different than our own. There are no humans left. 8 other sackcloth dolls roam "the emptiness" trying to scrounge food and supplies while avoiding "the beast". And that's about all you know for a good portion of this film. 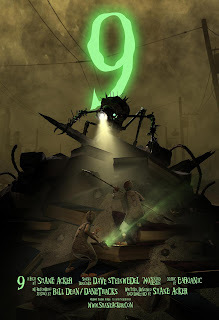 9 is an interesting little film that begins light on story and then slams you against the wall with an incredible one and a deep, deep meditation on humanity. This is a cartoon, but it's certainly not one to take the kiddos to. I really respect Shane Acker for making a PG-13 animated film about some sackcloth dolls and expecting people to see it. I respect pretty much anyone that doesn't just disregard animation as a "kid's genre". Now, for about the first 45 minutes I was trying to figure out what exactly was going on as there is almost nothing in the way of story or character development in that period of time. I also really did not enjoy the movie for that reason. Then we see some brilliantly worked in newsreel footage that explains the history of this war with machines that wiped out humanity over several years. From there we dive into the plot head on and when a final big twist regarding the nature of the dolls is revealed I had chills and nearly burst into tears. 9 is an extremely deep film that begs a repeat viewing because I believe the first act is a lot more intricate than it leads on. I also really admire the genre blending that happens here. It goes from "human" drama to full-fledged action-adventure mode in a few seconds and back again but never feels like it's genre-hopping. Also, the timeline of this alternate history is never revealed, but it appears to take place in the cold war era which I find super intriguing. 9 is a rather bleak, beautiful film that is simultaneously heartbreaking and hopeful. I'm glad Tim Burton and Timur Bekmambetov for seeing a new talent in Shane Acker and bringing his vision full circle from the short film 9 is based off of. Good call guys. yes, I rated this out of 9.